I hope you had a great Thankgiving. The team at Spoke Network is very excited to release Similar Companies, a feature you will find on company profiles. With this feature, you can now very quickly and easily identify which companies are competing with each other. They are the first ones on the Similar Company list and as you are moving down, you can also surface companies that are competing on part of somebody’s offering or similar companies that are part of the same ecosystem. Taking Cloudera as an example, you can identify the first two direct competitors as Hortonworks and MapR who appears on 10 lists together (hold your thoughts we will come back to that) and then Qubole, which provides a managed solution for Hadoop and then companies such as DataStax, Pivotal and IBM BigInsights who are providing analytics to the enterprise. As you are clicking on more, more companies are appearing which are less similar but still relevant. Coming back to the question that is now burning your tongue: how are you ranking the companies? This comes straight from our scalable Semantic Web Platform. As our team and partners are creating lists where they assemble relevant companies together, we basically count how many lists a specific pair of companies are together and use the number of lists as our ranking mechanism. If two companies appear the exact same amount of time together with another company then we are using the number of employees and then amount of funding to finish the ranking. Our classification is stronger where we have coverage. At this point, we feel very really strongly about our classification for Big Data, Marketing Technology and Mobile. Our classification favors the bigger companies. They are covered more by analysts and therefore appear in more lists together so they should appear first in any classification. That said, we have been surprised that the true competitors seem to be appearing on a consistent basis first despite their size. Clicking more to see the entire list makes sense: As the bigger companies appear first, the eventual disruptors of a particular company will appear later down the list. Clicking on the similar company is very important in your analysis as it could give you hints of particular clusters of companies. 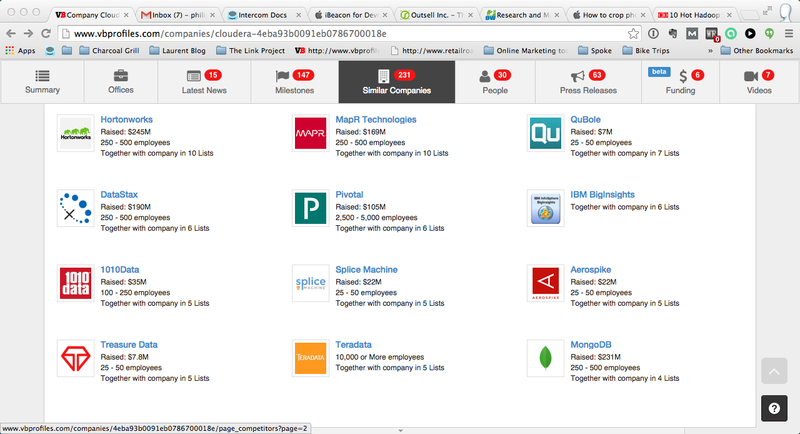 In our Cloudera case, if you click on DataStax, you will see surfacing companies like MongoDB, Couchbase and Marklogic before Hortonworks and MapR Technologies. We consider this approach as a first draft so we are relying on you to give us feedback. Easiest is to do it directly on the site using Intercom.io. Based on those feedbacks, we will make adjustments. One final note: talking to experts in the industry about our approach, we realize that the notion of similarity is very vague and that we are tackling only one notion of similarity at this point: are two companies competing or part of the same ecosystem? But there are many others and a list of other similarities could include: same founding groups, same past company employees, same location, and same investors among others. We will wish all of you happy holidays.